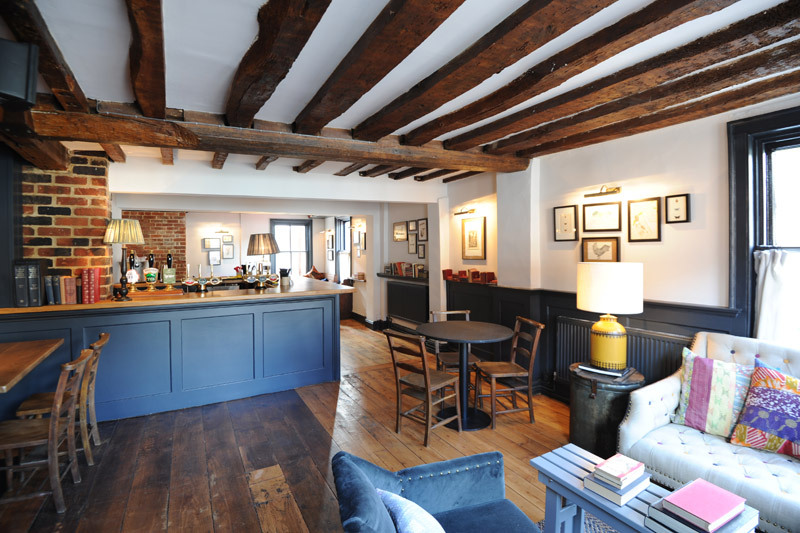 Cosy and welcoming, Kingsclere’s Bel & The Dragon is a quintessential English country inn. Inside you’ll find roaring fires and rustic, homely decor – think exposed brick walls hung with monochrome sketches, comfortable sofas to flop on, and corners filled with wooden Ercol chairs and chalkboard tables; perfect for keeping weary children (and adults) entertained. On a Friday night the bar was filled with a vibrant, bustling crowd of locals and visitors in high spirits. It’s hard to think of a more atmospheric place to step into from the sleepy village streets outside. Kingsclere is a gorgeous Hampshire village on the edge of the North Wessex Downs – a designated “Area of Natural Beauty”. It makes a perfect base for an overnight stop en route from London to the Cotswolds or Cornwall, as well as being just a few miles drive from Highclere Castle – the Jacobethan home of the Earl and Countess of Carnavon, better known as “the real Downton Abbey” thanks to its appearance in the hugely popular ITV period drama. Kingsclere itself has a few local amenities and the 20th-century British art gallery, Jenna Burlingham Fine Art, while the towns of Reading and Basingstoke are also nearby. 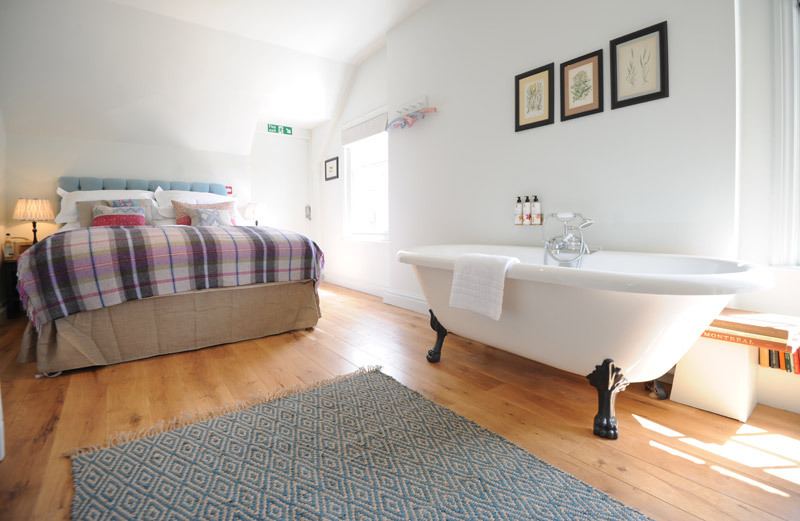 There are nine rooms available at the inn, including four premium doubles, and all guests have access to a beautiful timber-beamed lounge that’s stocked with books, classic board games, tea and coffee making facilities and even complementary whisky. Inside the rooms are snug and luxurious, with clean, contemporary decor throughout. Highlights include a waterfall shower and an enormous clawfoot bath with organic Bamford amenities, and an exceptionally comfortable bed. On a busy evening, you can hear some noise from crowds in the pub below, but when visiting we weren’t kept awake. As you would expect from a building that dates back to the 15th century, it can be a little draughty, but there are plenty of heaters and blankets to snuggle up under too. Freestanding bath at the foot of your bed? Sure, why not! From a great full English breakfast to a traditional Sunday roast lunch, Bel & The Dragon is a country inn that specialises in classic British bistro dishes done well. A sharing platter of pink peppercorn squid was crisp and perfectly cooked, while the fish pie was piping hot with a creamy potato top. It’s also worth saving room for dessert – the rich (yet gluten-free) chocolate brownies were delicious – and you’ll find a much better wine list than you might expect. Try Bel & The Dragon’s own house red, a Syrah Grenache blended from the Languedoc, which was excellent. Service, meanwhile, was efficient and friendly, without being overbearing. Brunch is a much quieter affair than dinner, and snacks are available all day. 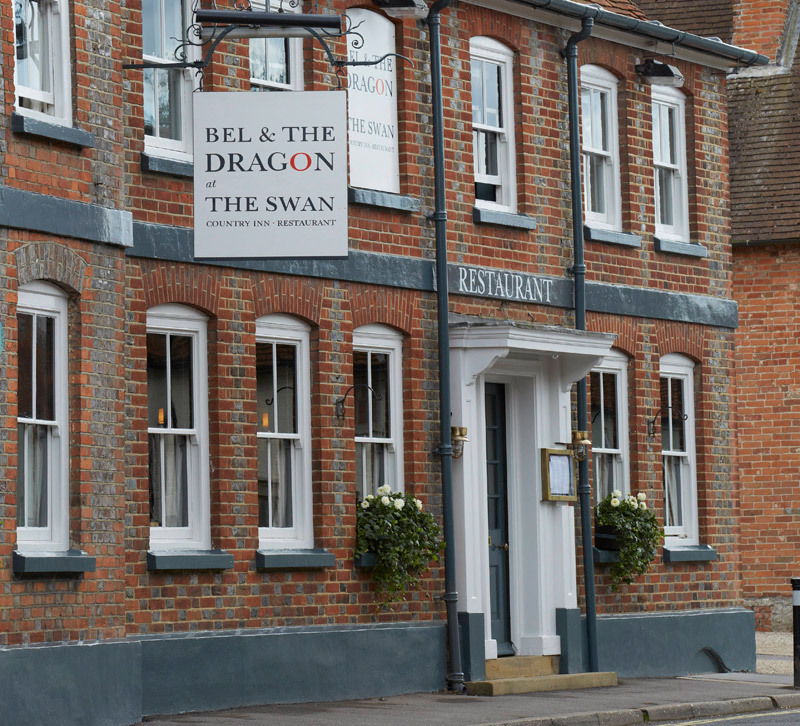 A lively and atmospheric country pub with rooms, Bel & The Dragon makes an ideal overnight stay. Just an hour’s drive from Heathrow airport, it’s well worth stopping over en route to Wiltshire’s many historic sites. And, should you find yourself heading elsewhere, there are five other Bel & The Dragon’s in Britain too.